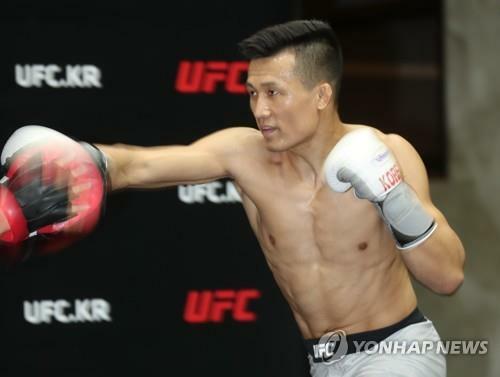 SEOUL, Sept. 19 (Yonhap) -- South Korean mixed martial arts (MMA) fighter Jung Chan-sung said Wednesday he is ready to return to the octagon after sustaining a knee injury that has kept him on the sidelines for more than a year. Jung, better known by his nickname Korean Zombie for his aggressiveness, will face Frankie Edgar of the United States in a main card event at the Ultimate Fighting Championship (UFC) Fight Night 139 at Pepsi Center in Denver, Colorado, on Nov. 10. Jung, who has 14 wins and four losses in his MMA career, is ranked 10th in the UFC featherweight rankings. Edgar, who has a record of 23 wins, six losses and one draw, is ranked No. 3 in the weight class. "I think it's great to fight against a living legend," Jung said at a media event at a gym in Seoul. "I heard that I may get a title bout if I win this match, so it pushes me to work harder." The bout will be Jung's first since February 2017, when he knocked out Dennis Bermudez in his UFC return after completing mandatory military service. Jung then prepared for a bout against Ricardo Lamas, but he ruptured his anterior cruciate ligament and medial collateral ligament in his right knee, among other injuries, during training in June 2017 and was forced to sit out of the match. 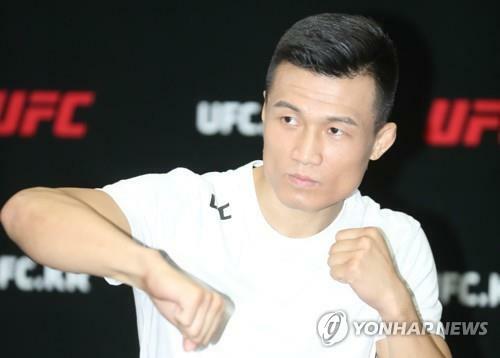 Jung, who made his UFC debut in 2011, said he thought about quitting the fight for about a month after sustaining the injury. But he has now recovered both mentally and physically, adding that he is now "120 percent" fit. "My knee is actually better than before I sustained that injury," he said. "I have no pressure at all regarding injury." Against Edgar, Jung said he didn't prepare special skills, and will use his own strength as usual. "I asked myself, 'What would Edgar do to defeat me?'" he said. "Then I answered that he'll try to take advantage in wrestling and maybe go for a submission. I'll focus on quick punches, but I'm not going to shy away from wrestling." Jung, 31, said a yearlong absence will not affect his game, claiming that he'll have a better performance than what he did against Bermudez. "Compare to the time of absence that I went through ahead of the Bermudez bout, this 21-month absence isn't really a big deal," he said. "When you're at the UFC level, you don't really worry about a long absence without a bout. Even if I didn't have a competitive fight, I believe I can show my skills if I do it correctly." Meanwhile, when asked about his prediction on the upcoming bout between Khabib Nurmagomedov and Conor McGregor, Jung said he's rooting for both lightweight fighters. "Probably Khabib will win with his wrestling skills, but as a fan, I think McGregor can also win," he said. "One thing is sure. I will not fight in the lightweight division."